The club maintains 50, 100 and 200 yard High Power Ranges. There are 12 covered firing points with shooting benches. 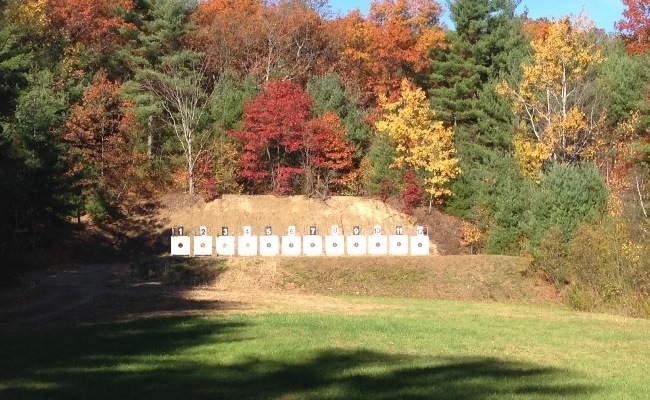 The 200 Yard range includes “Pits” for target operation during some High Power Matches. WSA High Power hosts an Indoor/Outdoor match every Sunday. November through March, schedule permitting, check the calendar or contact the High Power Chairman. You need not compete every week. Shoot from inside the High Power house, out the windows. 200 Yards, offhand (standing), slow fire. Loading only one round at a time. Shooter will fire 20 rounds in 20 minutes, no sighters. Targets are then retrieved and scores are recorded. WSA Classifications and awards are based on monthly average. Any rifle, any sight, including any scope any magnification. For more information contact the High Power Chairman. WSA High Power hosts an Outdoor match the 1st Sunday of each month. May through October, schedule permitting, check the calendar or contact the High Power Chairman. You need not compete every month. Shoot from covered firing points outdoors. 200 Yards, offhand (standing), slow fire. Loading only one round at a time. Shooter will fire 20 rounds in 20 minutes, no sighters. Targets are then retrieved and scores are recorded. Awards are based on the season’s average and classification. Any rifle, any sight, including any scope any magnification. May through October, schedule permitting, check the calendar or contact the High Power Chairman. Shoot from covered firing points outdoors. The course of fire is 20 shots for record (no sighters) prone, on the SR-52 (600 yard reduced) targets at 200 yards, in a time period of 20 minutes. Targets are then retrieved and scores are recorded. Any centerfire rifle less than 50 caliber. Any sights, Iron or scope (two separate classifications). May through October, schedule permitting, check the calendar for dates or contact the Running Deer Chairman. A life sized deer target running on a track approximately 80 yards from the firing line. The shooter gets 4 shots at the target then the scores are radioed to the firing line and marked on a target so the shooter can see where he's grouping - hitting the deer. This encourages match re-entry to try a new lead on the deer. For more information, contact Running Deer Chairman. Saturday & Wednesday mornings, May through October, schedule permitting, check the calendar or contact the 22 Benchrest Chairman. The course of fire is 20 rounds in 30 minutes, unlimited sighters are allowed on the sighter target within the 30 minute time allotment. Single round load only. Any sights are allowed but for obvious reasons, scopes are recommended. For the Wednesday 200yd and 100yd matches, and the 200yd Saturday matches, any class .22LR rimfire rifle may be used. Any brand of .22LR rimfire ammo may be used. May through October, schedule permitting, check the calendar for dates or contact the CMP Chairman. These are usually 50- or 80-shot, NRA-approved matches. Cost: $15 for adults, and $5 for juniors. The course of fire is 10 or 20 shots offhand (plus 2 sighters), 10 or 20 shots rapid sitting (plus 2 sighters), 10 or 20 shots rapid prone (plus 2 sighters), and 20 shots slow prone (plus sighters). All firing is done from the 200 yard line. The rapid and slow prone strings are done on targets simulating 300 and 600 yards. Scores are submitted to the NRA, and will count towards classification. For more information contact the CMP Chairman. May through October, schedule permitting, check the calendar for dates or contact the Lead Benchrest Chairman. First relay at approximately 10:15am.